Crocker-Con is once again going to be amazing. More exhibitors will exhibit. More cosplayers will cosplay. And you'll have that much more fun. 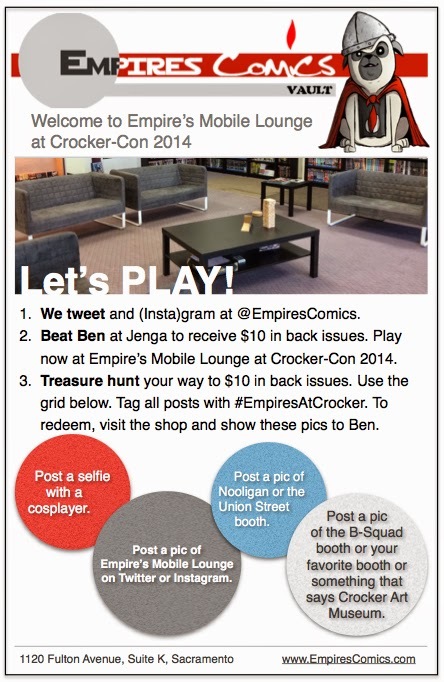 Not to mention we're transplanting Empire's Lounge to this year's Crocker-Con. "Empire's what..? ", you ask. So, really, this is a sneak peek at what we're doing at Crocker-Con. We think you need to be there. But wait. There's more. "And what else?," you ask? Three things. First, sign up to play Jenga one-on-one against Galactic Jenga Master Ben-jenga Schwartz. If you beat him, you'll be put on the list to select $10 in back issues. Make sure to swing by the shop within 30 days of Crocker-Con to collect the back issues of your choice. Second, we've set up a mini-, super-easy treasure hunt of things for you to find and post at Crocker-Con. Find them, post them, tag them #EmpiresAtCrocker, and you're eligible for $10 in back issues at Empire's Comics Vault. Just visit the shop, show the pictures to Ben, and you're in. Once again, visit within 30 days of Crocker-Con in order to get those comics. Third, you can do both! So, you could end up with $20 in comics. And wouldn't that be fantastic! Get your tickets online at CrockerArtMuseum.org. For more information and other updates, visit the Crocker-Con Facebook event page.